[Made Of Fail] Episode 50 – Everybody Fest! Welcome aboard George as the new regular co-host! George was last heard on Episode 38: If the Monkey Wants Your Banana. He is also my roommate and southern BFF, and has a few sound quality issues with his computer WE ARE GOING TO TRY TO FIX IT OKAY WE ARE VERY SORRY. This episode features appearances from SonikGav from live.lordkat.com, Angie from Strangers From the Internet, my friends Chris, Sean and Breda, Linkara, LordKaT, RolloT and Skitch from Channel Awesome/TGWTG.com. U jelly of our MAGFest trip? Don’t be! It’ll be in the same place next year, Jan. 3-6 2013. We plan on going, so show up and please say hi! Angie has written up blogs of her own about the trip, and is featured at the very beginning of the Angry Video Game Nerd’s Autographs & Arcade video! 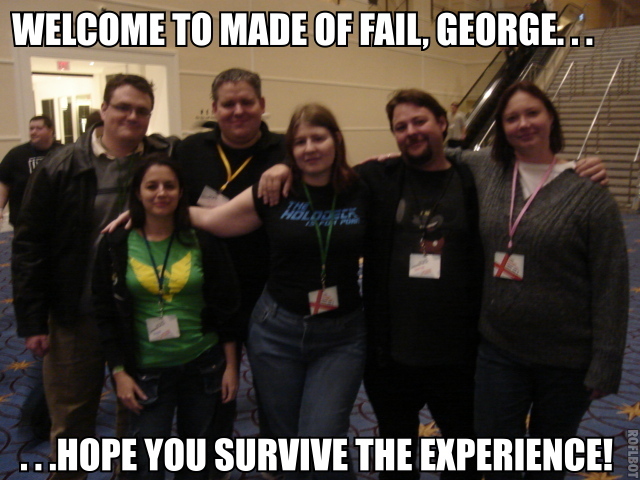 Also, the first of the Made Of Fail audio dramas is up! Go listen to Star Trek: Galilea Episode 1 – Beginnings and let us know what you think! Looking forward to good times ahead, George. Congrats, good first episode. And yes, Christopher Eccleston reigns supreme.